I started my blog two years ago with the hope that eventually it would be self-sustaining. With some amazing sponsors from the Dallas design community supporting my efforts, and a slew of new ones to come in January, that dream is a reality. It has also been a longtime wish to team up with a local charity, and so that's where Dwell with Dignity comes in. You'll notice their badge on the right column of this page. Ten percent of all my sponsorship proceeds now go to help support their cause. Inside the Dwell with Dignity Offices: Laundered and frayed cotton canvas drop cloths make surprisingly pretty draperies; mirrored sconces and chairs were inexpensive finds at the Benefit Store; vintage Steelcase desks from Dallas Desk. 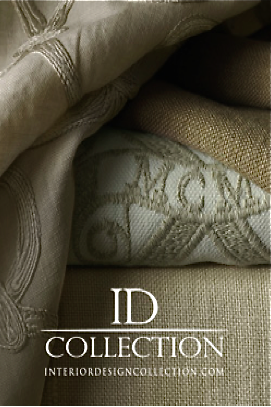 "Often the people who can least afford it, could benefit the most from living with good design," Lisa Robison tells me. An interior designer, she founded Dwell with Dignity only 18 months ago, and the story behind how it started is a good one. With her 40th birthday looming, and husband Doug repeatedly asking what she wanted, Lisa was at a loss. "I couldn't think of anything I wanted or anything I even needed. I had everything already," she remembers. Then she picked up a book by Oprah, and to be expected, it was full of feel-good advice. "It sounds corny, but Oprah said to find what you're passionate about, what makes your heart beat fast, and figure out a way to give that thing you love back to the community," says Lisa, who'd been dying to get back into interior design after putting it on hold while her two children were young. Now that they were older (Zach is 7, Zoe is 12), she toyed with the idea of returning to work. But she didn't need a paycheck. She needed a passion. Dwell is in the details: The turquoise, green and gray color scheme of the Dwell house was based serendipitously on the colors of donated items; a throw from Anthropologie becomes a window valance; donated animal print fabric, stitched and tied with ribbons, hides a shelf full of papers and office supplies. Often the color schemes and design focus of the apartments that Dwell designs for families are inspired by a single donated object. "With interior design, I was serving a privileged clientele, and I couldn't figure out how I could possibly give back to those in need doing that," Lisa remembers. She contacted Habitat for Humanity, but quickly decided it wasn't for her. "I wanted the freedom to express design without being part of a big machine," she says. Too, she wanted Zoe to be able to volunteer with her, and she didn't meet Habitat's minimum age requirement. Then the idea hit her: "I told my husband I wanted seed money for my birthday to start my own nonprofit." Doug gave her a lump sum and part of his company's warehouse to store donated furniture. Lisa began interviewing social service agencies with established programs. Her goal was to help needy families transition from poverty and homelessness into housing that she designed. "I knew I needed to team up with agencies with strong programs already in place, and I needed the families to be invested in changing their lives for the better," she says. 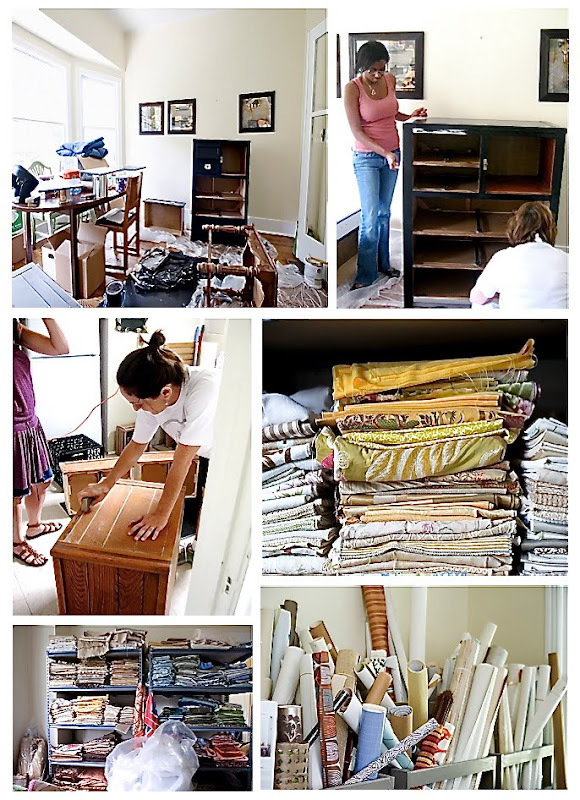 In May, 2009, with the help of a couple of friends, Lisa installed her first apartment in conjunction with Interfaith Housing Coalition, for a mother and a baby. 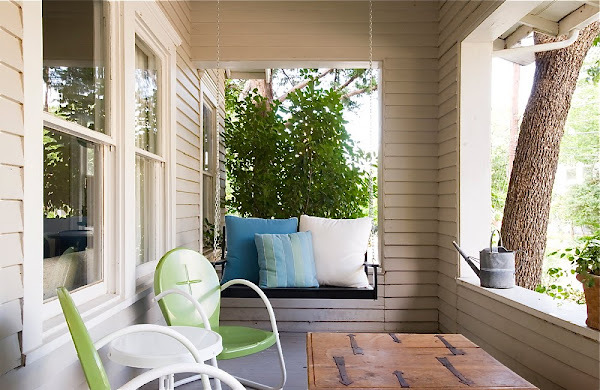 It was a DIY, shoestring budget, with furniture and accessories she bought from Round Top and fringed draperies made from Home Depot canvas drop cloths. 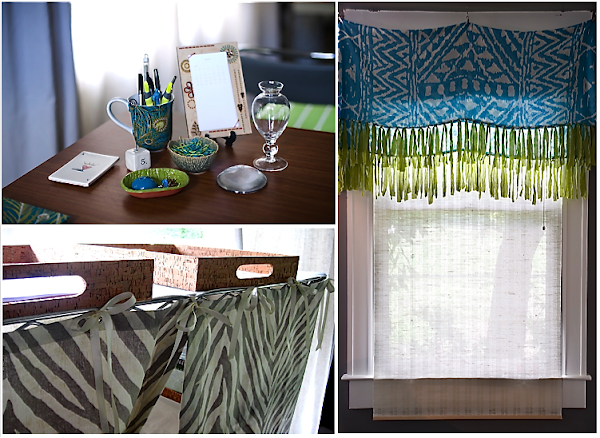 A valance in the kitchen was devised from a colorful skirt bought at Anthropologie. At the time, her only donation was a high end grasscloth wallpaper, which she put in the kitchen. 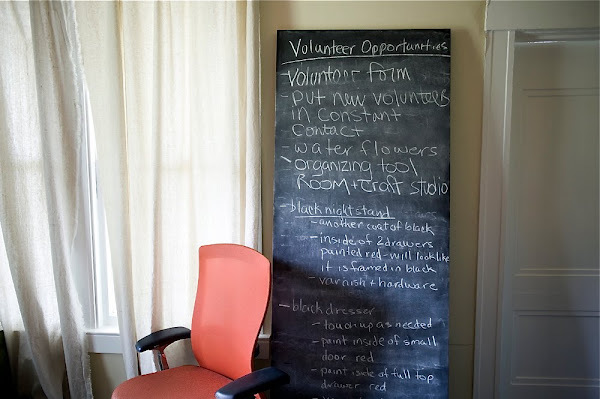 How Clever: Samples of slate roof tiles become mini chalkboards for Dwell volunteers' notations. They're hung on vintage fleur de lys hooks uncovered at Round Top. Lisa never imagined how her seed of an idea for a nonprofit would explode into a thriving interior design program that is booming. "Sometimes I think my husband wishes he'd given me an expensive piece of jewelry instead of seed money," Lisa says with a laugh. "I thought it would be me and maybe a couple of friends doing a few projects a year. I had no idea the design community would get behind us the way they have." With the help of 26 core volunteers, including a dozen interior designers and a leadership council made up of people with expertise in marketing, fundraising, business and web design, Dwell with Dignity has designed and installed 10 apartments for needy families in the past year and a half, all through agencies like Interfaith Housing Coalition, Family Gateway, and City Square (formerly Central Dallas Ministries). Right now, they're designing a teen center for Interfaith Housing that will be a space for kids to study, use computers, watch TV, and hang out in a safe, beautifully designed environment. Interior designer Kim Turner, a longtime friend of Lisa's, joined early on as a volunteer and is Dwell's unpaid executive director. A team of hardworking people led by Erica Drake hold weekly workshops where donated furniture is repainted and refurbished. 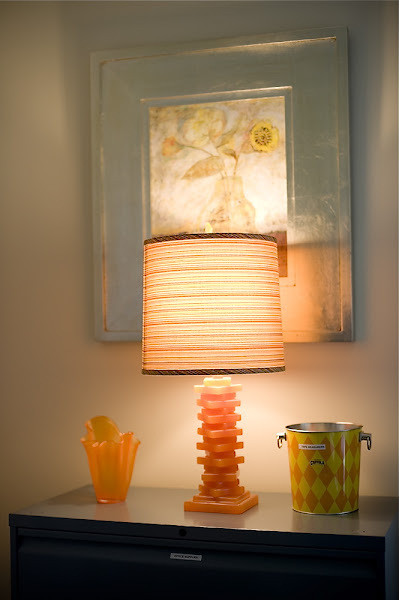 Orange lamp and vase were donated by Again & Again. "The design community has found a charity to embrace, and we are thrilled. They're the ones who understand best how your environment impacts your life," says Lisa. 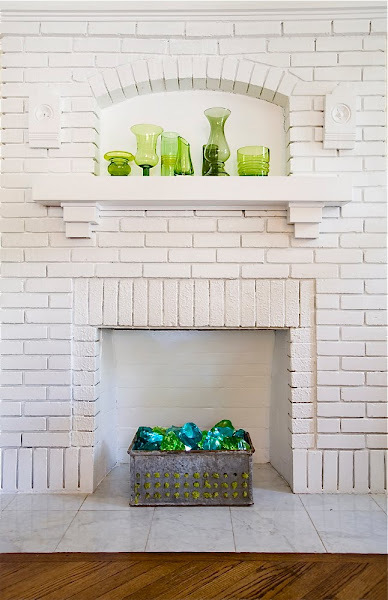 Dwell is headquartered in a charming 1915 bungalow in the Oak Lawn area, which an anonymous donor is providing free of charge for now. PegasusAblon Properties has temporarily donated a large warehouse in the Design District to store Dwell's hundreds of donations, many of which come from supporters like the Container Store, Global Views, Sutherland Showrooms,Culp Associates, Texas Paint and Wallpaper, and the Curtain Company. ASID's local Christmas event this year is slated to benefit Dwell with Dignity. 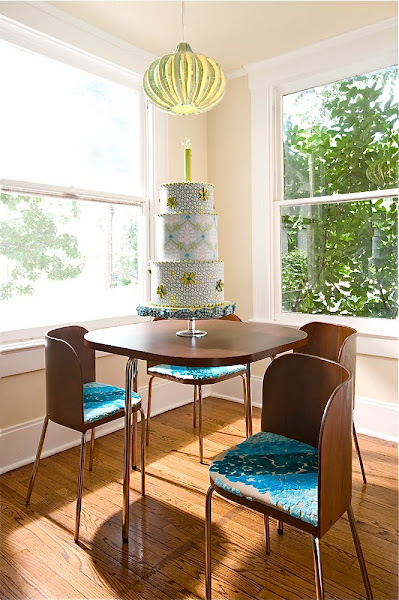 West Elm table and chairs (recovered) and a charming fabric birthday cake made by designers Ann Fox and Robin Riddle, to celebrate Dwell with Dignity's one year anniversary. The pendant is a garage sale find. "The psychological aspect of poverty and homelessness is often overlooked," says Lisa. "But your environment inspires your mood and your actions. It can uplift you, just like walking outside on a beautiful day lifts your spirits. It's so basic and pure. Part of the reason I love design is that I'm very aware of how it makes me feel and react in my world. And I understand how design translates into helping others." Big Mango Trading Company donated a pile of green and blue slag glass, which Kim put inside a vintage metal container once used to brine hams. She filled it with moss, then put the slag glass on top, along with small touch lights that when turned on, illuminate the glass from underneath. 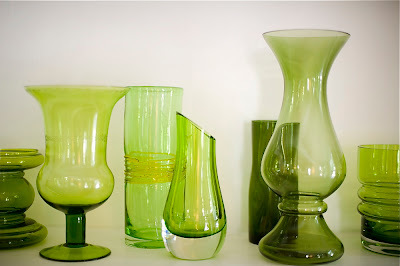 The green glass was donated by a group of photographers who were cleaning out their prop inventory. The lamp, iron coffee tables, and turquoise trays are donations from Global Views. 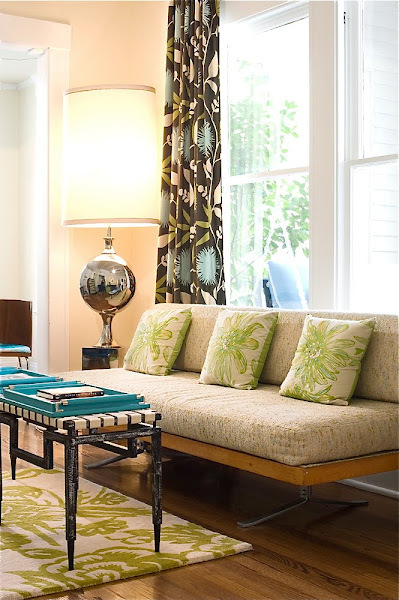 The sofa is vintage from Form on Henderson, the rug was donated by Neiman Marcus, and the pillows and draperies were made by the Curtain Company. 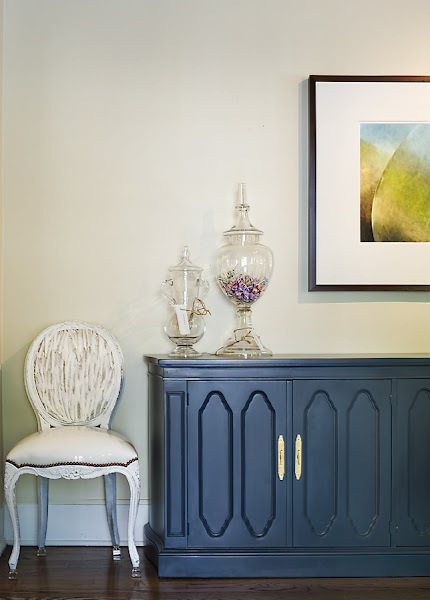 The credenza was donated by Leslie Bell's Estates and More and repainted in Mysteria by Benjamin Moore's Aura. The white patent leather chair with feathers was designed by Dwell with Dignity volunteer and blogger, Samantha Reitmayer of Style Swoon. 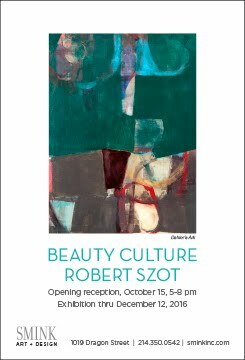 The photograph is on loan from Richard Bettinger. 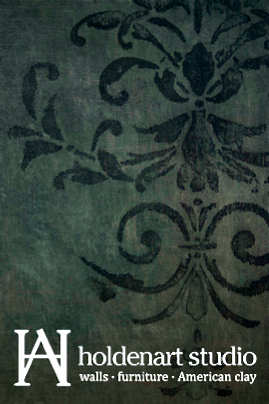 Dwell with Dignity has a huge following on their Facebook fan page, take a look. Working it: A work room inside the Dwell House; volunteers painting and sanding donated furniture; dozens of high end fabric samples and wallpapers donated by showrooms. "We need funding!" declares Lisa, who is launching Dwell with Dignity's first membership drive soon. "Memberships and corporate underwriting will allow us to continue to do what we're doing," she says. "We need enough funds to hire a volunteer coordinator to tap into the resources of people out there we know want to help. We need help with our operations on a more professional level. Most of our supporters are working individuals, and we hope to hire a small staff to help us keep doing what we're doing on the level we're doing it." 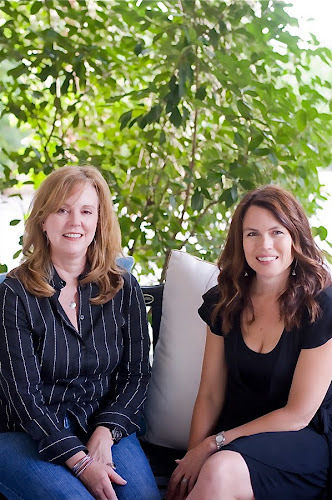 Lisa and Kim not only handle the creative interior design aspects of the organization, but the day to day management, fundraising, marketing, and procurement of donations. "It's almost overwhelming," Lisa says. Go to their site here, and see the ways you can help. Lisa and Kim often arrive at work to find donations stacked up on the front porch of the Dwell House. 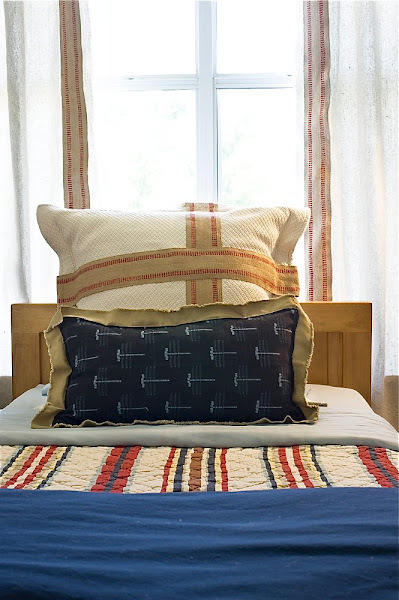 D Fadal Designs on Dragon Street donates almost all of the labor involved in making draperies, bedding, and upholstery for the apartments that Dwell with Dignity designs. "We're never really sure what we'll get donated, or who the family is until the last minute. It's challenging. It forces us to be very creative," explains Lisa. "We start with an inspiration that's usually a donation or a fab piece of upholstery, then we work with other donated pieces to try and enhance the space with what we have. It's not like a regular design job where we get to go through hundreds of wings of fabric in the showrooms to find the perfect fabric. But in the end it comes together so well." Boy oh, Boy: This boy's bedroom is one of three that Dwell with Dignity designed for an apartment to house three young men in their early 20s, all transitioning out of foster care and into City Square's highly successful Trac (Transition Resource Action Center) program. Study desks and chairs were donated by the Container Store, and Lisa and Kim designed clever bedside tables from plastic crates from the Container Store. Volunteers papered the drawers of this vintage dresser with old maps to carry out the apartment's global theme. 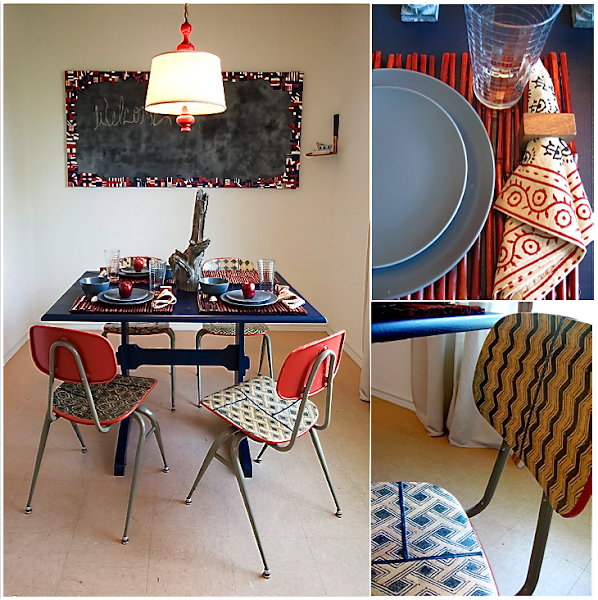 A small dining area in the boy's new apartment includes these vintage metal school chairs, which have been decoupaged with canvas pieces that have been printed with vintage Kuba cloth patterns downloaded from the Internet. Did you know that you can put a square of canvas from Michael's through a copy machine? I didn't. 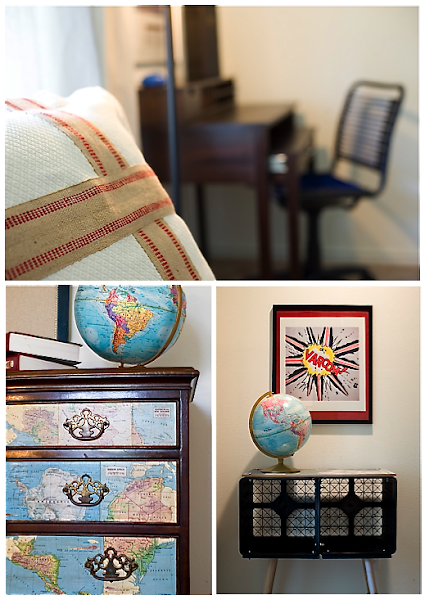 British Invasion: Vintage game boards were used as decoration, along with vintage globes. 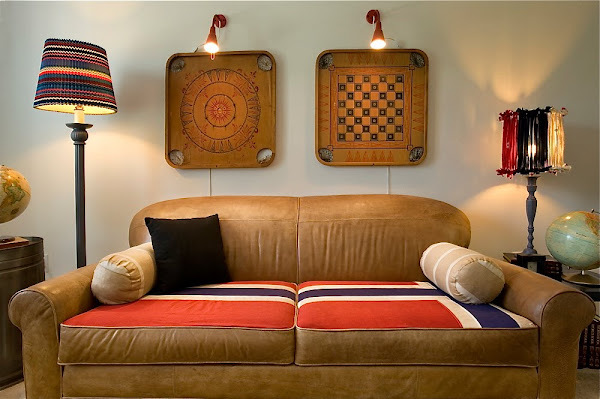 A hefty leather sofa is just right for rambunctious boys, and Jon Tutolo of Haven donated the vintage British flag and took care of having it upholstered onto the seats. 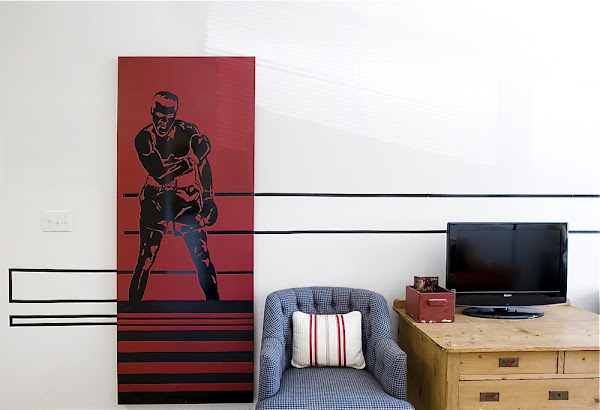 A hollow core door from Home Depot makes a perfect canvas for decal art of Muhammad Ali. The checked chairs are from the Benefit Store, and an old donated chest got new handles made from red braid. An anonymous donor provided the television set. 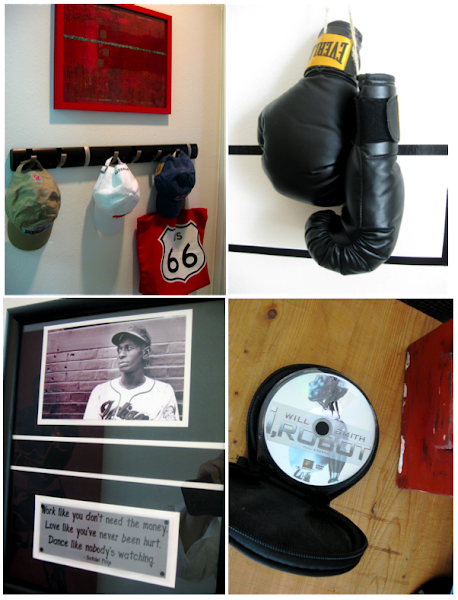 Live Like You've Never Been Hurt: The boys' apartment was decorated with them in mind, such as ball caps collected from different Super Bowl games, framed photographs of athletes and inspirational quotes, and a DVD case stocked with PG movies ready for the boys and their friends to watch as soon as they move in. Stock Up: The refrigerator and pantry of every apartment that Dwell with Dignity designs is completely stocked with staples and two weeks' worth of food for the family on move-in day. It takes about $200 to stock a family's pantry and refrigerator, and when there's no underwriter to foot the bill, Lisa and Kim pay for it out of pocket. For a recent installation, Kim cooked a pot roast in a Crock Pot on the day the family moved in, so that they'd have a warm meal that night. "The smell was so wonderful, and I heard later that the mom started crying knowing that they would have dinner that night," says Kim, who knows that as a mom herself, it's important that the families moving in know that their basic needs will be met until they can get back on their feet. 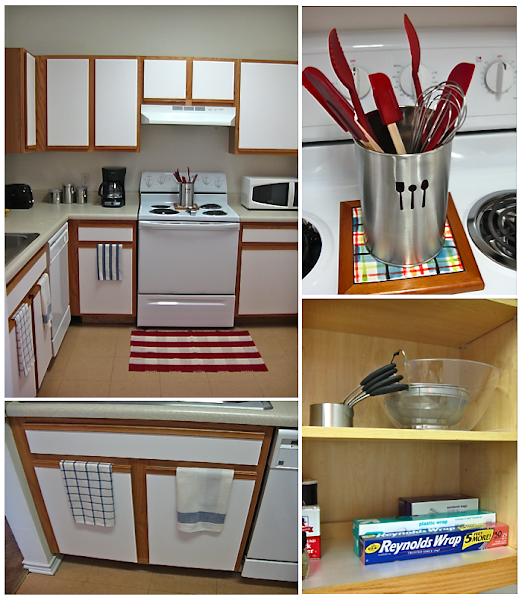 Everything the boys will need to start cooking for themselves is provided, including pots, pans, microwave, toaster, coffee maker, and utensils. Hometown Heros: Nathan Grace Real Estate has underwritten all of Dwell with Dignity's small appliances and kitchen needs for 2011. Says Kim: "We stock the bathrooms with two sets of towels, buy an ironing board and iron. 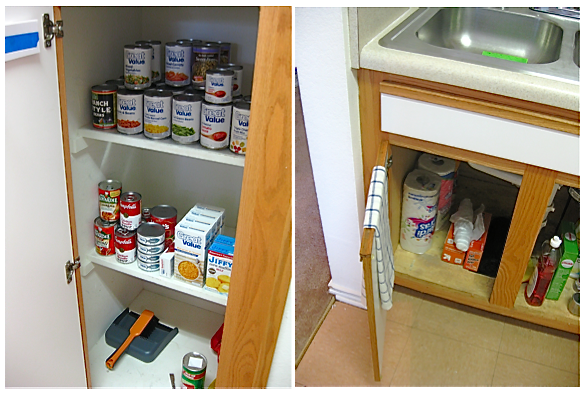 We take care of their basic needs when they move in, because most of the time, these families have hit rock bottom. Often times, they haven't had a place to sleep. Or it's just been a mattress on the floor with no sheets. 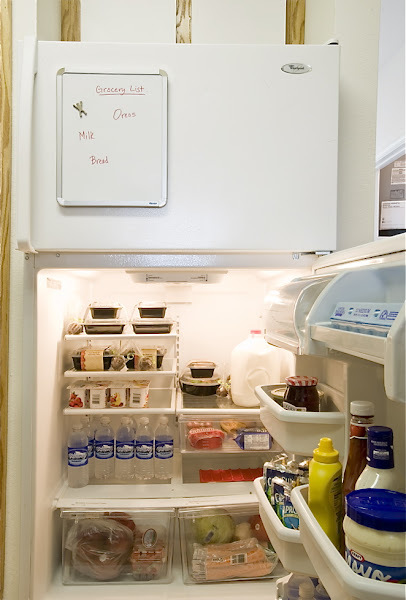 We take care of their basic needs at home so they don't have to worry about it. It gives them something to be proud of, something to aspire to." 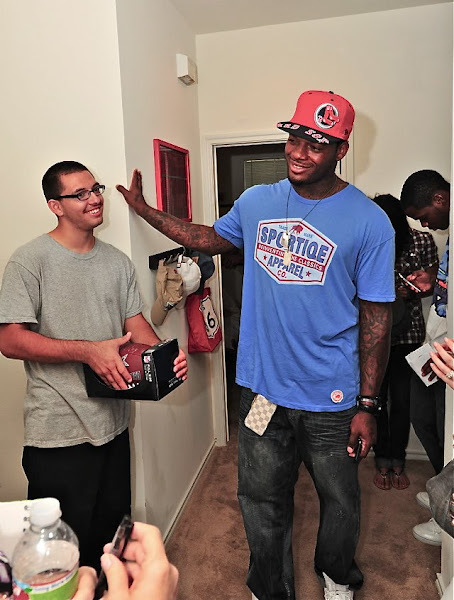 At right, Dallas Cowboys tight end Martellus Bennett signed a football and gave a pep talk on move-in day this summer for the three boys who will be living in a Dwell with Dignity-designed apartment, sponsored by City Square's Trac program. Felix, left, was living in foster care until he reached age 18. The Trac program helps transition young adults into college, work, and living on their own. 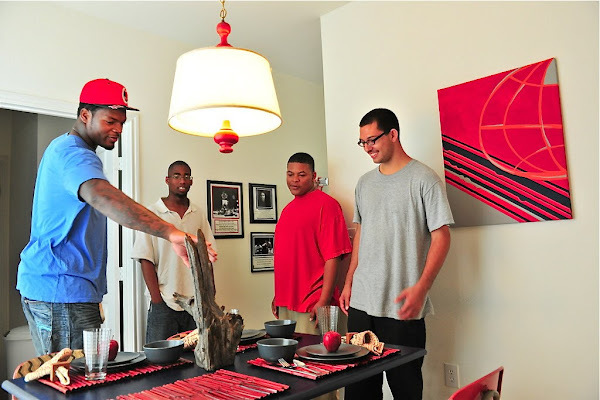 Martellus is a client of volunteer and interior designer Abbe Fenimore of Studio Ten 25 who helped arrange for him to meet the boys for the apartment's unveiling. Martellus checks out the table centerpiece along with new tenants Vandy, Josh, and Felix. One of the great things about the Trac program is that these young men, along with others in the program, will have their educations completely paid for at any state college that accepts them. Most of the time, Lisa and Kim never get to see the families who move into their housing until weeks or months later. "It's such an emotional, intense time for them, and we give them their privacy," says Kim. 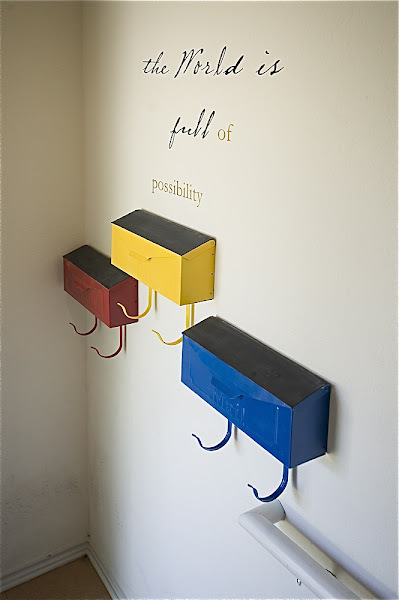 Stairway to Heaven: In the downstairs entry, there are three mailboxes that Dwell volunteers painted with blackboard paint so that the boys can write their own names in chalk on them. 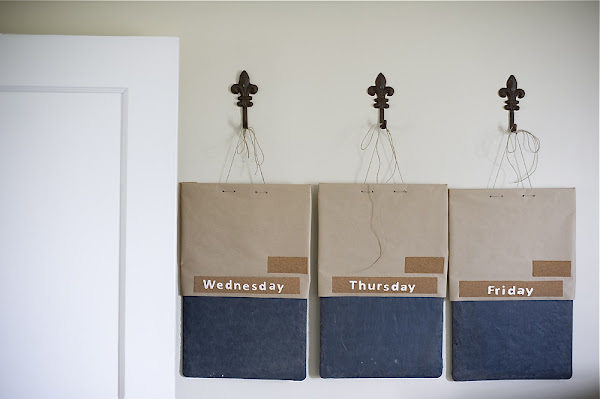 The hooks are for backpacks and coats. Dwell volunteers stenciled an inspirational theme on the wall to greet them. "A nice environment can make you feel safe. It can make you feel valued and nurtured. When you are proud of where you live, you function in an elevated manner," says Lisa. "They live with it for a while, and eventually it becomes the norm, something they seek and aspire to." Go here to see some of the beautiful apartments Dwell with Dignity has created for families.